For a while now I have been thinking of different ways to use the paranormal as a catalyst for deeper understanding in my teaching of religious education and religious studies in secondary and further education institutions respectively. I have found that my students, regardless of age, are often fascinated by the paranormal, influenced in part, no doubt, by the prevalence of occult themes in contemporary popular culture (superheroes being a particularly vivid expression of this), and the kinds of urban legends and folktales that spread amongst students in schools and colleges. It is also likely that individual personal experiences of the paranormal play a role in fostering this fascination—strange dreams, sleep paralysis experiences, ouija board escapades, and Charlie-Charlie experiments. This article will argue that taking the paranormal seriously in the context of religious education (RE) lessons can have benefits not just for religious literacy, but also for student well-being. In recent years, the attention of certain scholars in academic religious studies has shifted towards a focus on paranormal topics as an avenue for deepening our understanding of religion more generally. Jeffrey J. Kripal (2010), for instance, has argued in his book Authors of the Impossible that the paranormal is “our secret in plain sight,” and that it is deeply entwined in the histories of many of the world’s religions. Historian of religion Darryl Caterine (2011) has similarly recently referred to the paranormal as a modern analogue of religion, and, slightly earlier, sociologists Emmons and Sobal (1981) suggested that paranormal beliefs serve as functional alternatives to traditional religious beliefs, which have been fundamentally challenged through processes of modernisation and secularisation. There is ample reason, therefore, to take the paranormal seriously in the context of the study of religion (Laycock 2015), as well as in the context of teaching about religion. In paraphrase Jeff Kripal, the paranormal is the sacred in transition from a religious register to a scientific register. The paranormal may even be the future of religion. For many, however, paranormal and religious beliefs are viewed as something that ought to be eradicated, as a form of “pseudoscientific” or even “prescientific” thought. Popular sceptical atheists, such as Richard Dawkins and James “The Amazing” Randi, are particularly vocal in this regard. In a 1998 article on the paranormal, for instance, Dawkins concludes quite certainly that “[t]he paranormal is bunk,” and Randi is famous for denouncing all paranormal claims as “Woo-Woo” (whatever that might actually mean). And yet, despite such denunciations, claims and accounts of paranormal experiences and phenomena are still extraordinarily common: no amount of labelling of such claims as “bunk” and “woo” rids us of the fact that people do indeed seem to have genuine anomalous experiences (Castro, Burrows, and Wooffitt 2014), and that these experiences often play an important and transformative role in peoples’ lives, regardless of their ultimate ontological reality. The paranormal is also deeply enmeshed within our popular culture; it is everywhere. 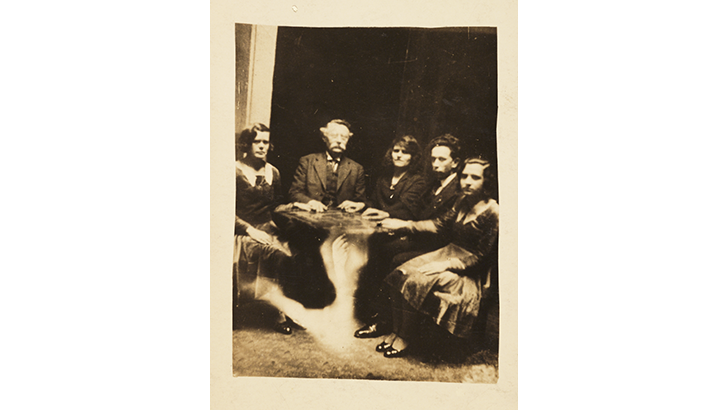 In addition to the links between the paranormal and the origins of the world’s religious systems, there is yet another reason that secondary RE teachers might consider taking an interest in the paranormal. It is probable that many young people will encounter a wide range of paranormal themes over the course of their social and personal development, whether through ghost stories and popular movies, or accounts of paranormal experiences and beliefs related to them by friends, family members and parents (Braswell, Rosengren, and Berenbaum 2012). Research has also found that children are particularly prone to anomalous, transpersonal, and religious experiences (Armstrong 1984; Tamminen 1994). Indeed, my own exploratory classroom based research with Year 7 pupils at a large secondary school in Shropshire found that, in a sample of three RE classes (75 pupils), 48% claimed to have had an experience that they thought was paranormal, and 62% claimed to believe in the paranormal. These are particularly high percentages, especially when compared to the number of pupils who claimed to be religious: 28% (Hunter, 2016). This data, although relying on a relatively small sample size, suggests that paranormal beliefs and experiences are more prevalent than traditional religious beliefs. The following is a brief reflection on an instance in which, as part of my own experience as a trainee RE teacher, I used the paranormal (UFOs specifically) as a springboard for philosophical discussions about “who or what is God?” The lessons took place with two Year 7 (11–12 years old) RE classes at a large secondary school in Shropshire, United Kingdom. Once pupils had done this, I asked for feedback from each group to tell me one of the questions they would ask. I then asked the pupils why they thought we were talking about UFOs in an RE lesson, so that it was the pupils making the connection themselves. Responses included that both religion and the question of UFOs revolve around belief, and we explored these issues a little further through deepening of questioning. I then explained how it is possible to ask many of the same questions about God as we can about UFOs, such as “Is God real?”; “Is God imaginary?”; “Why do people believe in God?”; “Have you ever had an experience of God?”; and so on. These responses to the question “Who or what is God?” are particularly insightful. The pupils were evidently thinking deeply about the question, their responses show a degree of creativity and critical thinking that is very impressive, and there is a range of perspectives from those who believe in God, to those who are agnostic, and those who are atheistic. It is this author’s opinion that beginning the lesson with a discussion of UFOs, and encouraging pupils to formulate their own questions about the UFO phenomenon, enabled them to make progress and think more critically and creatively about the nature of God. Pupils were encouraged to make connections between their own beliefs and ideas about UFOs and wider issues about the possible nature of God (a subject that they may previously have had little interest in exploring at school). The goal should not be to instil such beliefs in students but to get them to think critically about such beliefs. Science education…should not be narrowly conceived. The goal of science education should not just be to get students to understand science but to be scientific…Learning to think critically about pseudoscientific and paranormal beliefs is part of being scientific. The development of critical thinking skills is reason enough to include explorations of the paranormal in the RE classroom. This, coupled with OFSTED’s requirement to provide an opportunity for young people to develop their spirituality in school-based education, presents ample reasons to take the paranormal seriously in RE. I suggest that this open-minded and open-ended approach to religious education could be achieved through engaging with pupils' own experiences and beliefs about the paranormal in a manner like that outlined above. Through explorations of paranormal topics, pupils can be encouraged to develop their own informed opinions on a range of religious phenomena and experiences, as well as to develop a more nuanced understanding of their own anomalous experiences (should they have one). Furthermore, through making use of an emphasis on the experiential dimension of religion, it should be possible to foster a more tacit and empathetic understanding of differing religious perspectives, including a wide range of anomalous experiences, and so move away from purely explicit, fact-based, learning—we can approach a dimension of knowledge and understanding that cannot be expressed in any other way. Perhaps through this kind of approach it might be possible to foster an attitude of deep respect and understanding relating to anomalous experiences (as well as towards religion, and different modes of conceiving of the world), which can often play an important role in the lives of many people. Armstrong, Thomas. 1984. “Transpersonal Experience in Childhood.” Journal of Transpersonal Psychology 16, no. 2: 207–230. Braswell, Gregory S., Karl S. Rosengren, and Howard Berenbaum. 2012. “Gravity, God and Ghosts? Parents’ Beliefs in Science, Religion and the Paranormal and the Encouragement of Beliefs in their Children.” International Journal of Behavioral Development 36, no. 2: 99–106. Castro, Madeleine, Roger Burrows, and Robin Wooffitt. 2014. “The Paranormal is (Still) Normal: The Sociological Implications of Paranormal Experiences in Great Britain.” Sociological Research Online 19, no. 3: 1–16. Caterine, Darryl V. 2011. Haunted Ground: Journeys Through a Paranormal America. Santa Barbara: Praeger. Dawkins, Richard. February 8, 1998. “Aliens Are Not Among Us.” Sunday Mirror. Emmons, Charles F., and Jeff Sobal. 1981. “Paranormal Beliefs: Functional Alternatives to Mainstream Religion?” Review of Religious Research 22, no. 4: 301–312. Hay, David. 1998. “Why Should We Care About Children’s Spirituality?” Pastoral Care 16, no. 1: 11–16. Holt, James D. 2014. Religious Education in the Secondary School: An Introduction to Teaching, Learning and the World Religions. London: Routledge. Hunter, Jack. 2016. “Ordinary Theology in the Classroom: Experience and Belief in Secondary Religious Education.” RE Today 33, no. 2: 58–61. Kripal, Jeffrey J. 2010. Authors of the Impossible: The Paranormal and the Sacred. Chicago: University of Chicago Press. Laycock, Joseph P. 2015. “Religious Studies and the Paranormal.” EdgeScience 21: 12–14. Martin, Michael. 1994. “Pseudoscience, the Paranormal and Science Education.” Science and Education 3, no. 4: 357–371. OFSTED. 2015. School Inspection Handbook. Manchester: OFSTED. Tamminen, Kalevi. 1994. “Religious Experience in Childhood and Adolescence: A Viewpoint of Religious Development Between the Ages of 7 and 20.” The International Journal for the Psychology of Religion 4, no. 2: 61–85. Jack Hunter is a doctoral candidate in the Department of Archaeology and Anthropology at the University of Bristol. He has a degree in archaeology and anthropology from the University of Bristol, and a PGCert in secondary religious education from the University of Chester. He is a lecturer in sociology and religious studies at North Shropshire College. He has published several books on the intersection of anthropology, religious studies and the paranormal, the most recent of which include Talking With the Spirits: Ethnographies from between the Worlds (Daily Grail, 2014), Strange Dimensions (Lulu, 2015), and Damned Facts: Fortean Essays on Religion, Folklore and the Paranormal (Aporetic, 2016). He lives with his family in the hills of Mid-Wales.